Cleomes are stunners being in flower right through spring, summer and autumn. In warmer districts flowering continues for twelve months right through winter also. Another great attribute, once established, these Cleome require minimal watering. 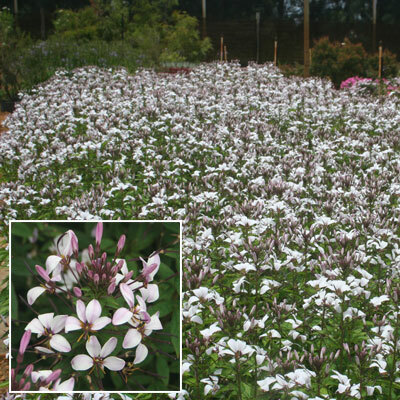 Cleome have many uses in the garden and outdoor garden room. In gardens individual plants which grow to 50cm high and 30cm wide give dramatic height to landscape plantings. Massed either in groups or planted as a hedge will achieve good results with little effort. Used either alone, at the back or in the centre of a large container a taller effect with constant flowering is attained. Few pests attack these plants. They are easy to grow once they are established. Most shrubs need to be nurtured for a few months after planting then they are generally self sufficient except in dry times. Mulching to 5cm is beneficial. Fertilise regularly every two or three months. Use favorite organic or slow release fertilizer. Pruning can be done as needed during the warmer months. Normally tip pruning will give more flowering as it encourages more shoots which each develops into a flower spike. Maintenance is easy. Deep green foliage holds to the ground. Birds and butterflies are attracted to the flowers. Cleome are widespread in Central America through to Brazil and Paraguay. Cleome Spinosa, one of the parents comes from this area. On the other side of the world, in the wide expanses of the Serengeti Plains of Africa with the many animals of that great area we saw one of the Cleome family, a pink flowering one, flowering in the grassland. This area is quite high and gets very cold in winter and very hot in summer. They generally grow in full sun, some species will grow to 1.5m in height.